This document (below, left) has apparently been copied many times thereby degrading the quality of the print. Numerous names had to be researched to confirm spelling and many remain undecipherable. Possible but unproven spellings appear in parenthesis with a question mark, e.g. (name?). Some names are partially spelled out with missing characters. A question mark appears for each character that was unreadable. Cpl Agee, John T, Jr.
Pvt Burkhalter, Clarence E, Jr.
Cpl Cook, George A Jr.
Pvt Gosselin, Phillip K, Jr.
SSgt Kluttz), Jacob M L, Jr.
Pfc Roberts, Ernest T, Jr.
Pvt (Marleno? 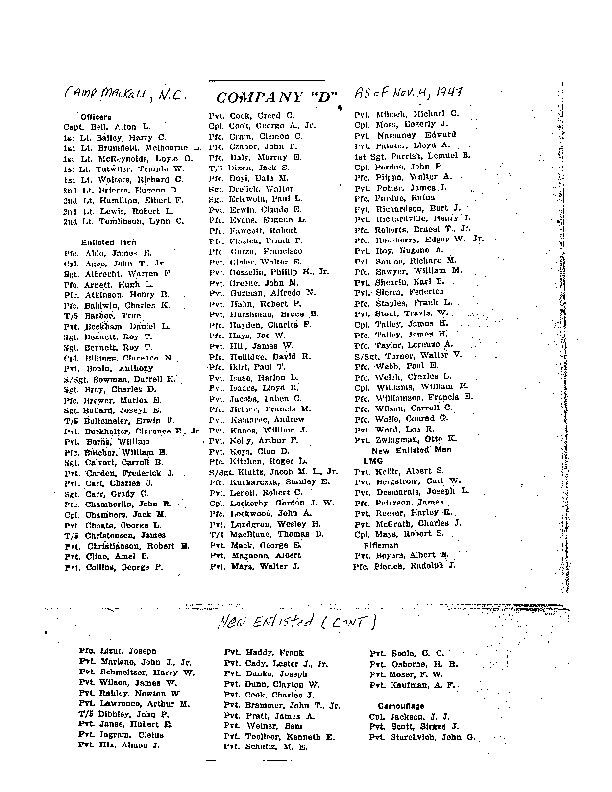 ), John J, Jr.
Pvt Cady, Lester J, Hr. Pvt (Brammer? ), John T, Jr.
Pvt Schultz, M. E. Pvt (Seele? ), C. C.